To change add your picture, click on the Account tab(found on the top right corner) and then click on the Profile Photo link. Click on browse button to find a picture on your computer and then press SAVE to upload it to WineAlign. How do I add my Twitter account? 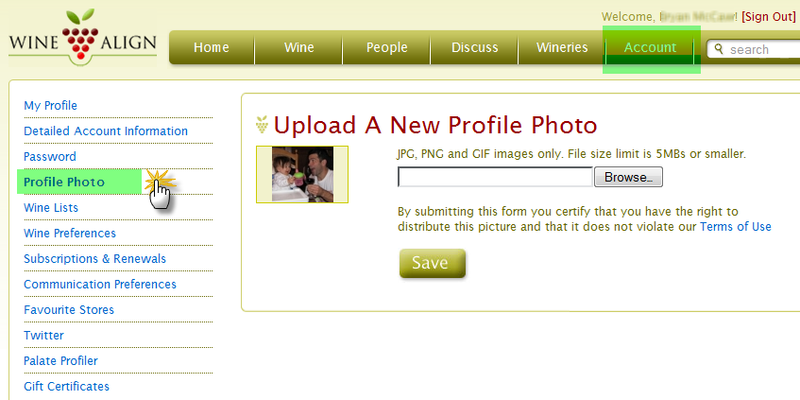 By adding you Twitter credentials to WineAlign we will automatically post wines you review to your Twitter account. To change or add your Twitter credentials, click on the Account tab(found on the top right corner) and then click on the Twitter link. 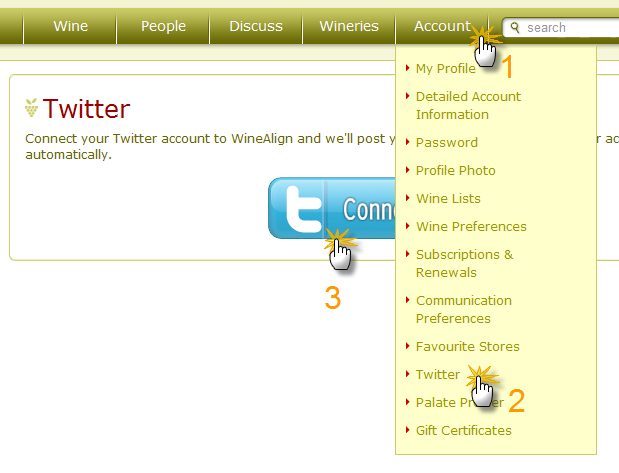 1) Login to WineAlign, click on Accounts, select Twitter and then press the big blue Connect button. 2) You will be sent from WineAlign to Twitter where you will see the following screen. Simply enter your Twitter username and password and click Allow. 3) After pressing Allow you will be automatically sent back to WineAlign. We'll send out a single automated test tweet stating that You are now tweeting on WineAlign! After that, everytime you review a wine on WineAlign your tweeps will know. You can also include a optional hash tag in all of your reviews, we will automatically prefix it with the pound sign #. To update your communication preferences, click on the My Profile link (found on the top right corner) and then click on the Communication Preferences tab. There are two notification options in the Communication Preferences. Click the checkbox if you wish to be emailed when someone either recommends a wine to you and/or sends you a friend request. Once you have changed your settings, click Save. How do I change my favourite stores? To change your Favourite Store settings, click on the My Profile link (found on the top right corner) and then click on the Favourite Stores tab. From here you can select the LCBO stores that you frequent most often and/or the ones most conveniently located to your work or home, for example. You may repeat the above steps to add more than one store. For the store you frequent the most often, click the box for “Make this my primary or default store”. You may also choose to enter a Nickname for each of your favourite stores (optional). To change your Password, click on the Account link (found on the top right corner) and then click on the Passwords link. Simply enter you new password twice and press SAVE. How do I change my rating display options? To update your Rating Display Options click on the My Profile link (found on the top right corner) and then click on the Wine Preferences tab. The Rating Display Options are found on the bottom half of the Wine Preferences tab in My Profile. 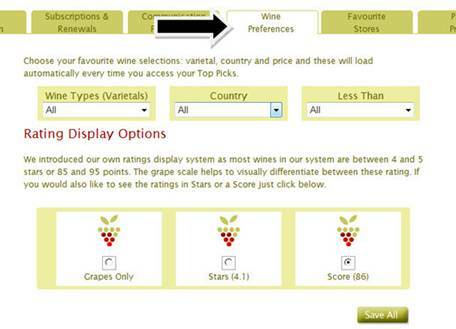 We introduced our own ratings display system as most wines in our system are between 4 and 5 stars or 85 and 95 points. The grape scale helps to easily visually differentiate between the ratings. If you would also like to see the ratings in Stars (out of 5 stars) or a Score (out of 100) just click on the one you prefer, then click Save All. How do I change my wine preferences, region, or price range? To update your Wine Preferences (wine, region or price), click on the My Profile link (found on the top right corner) and then click on the Wine Preferences tab. 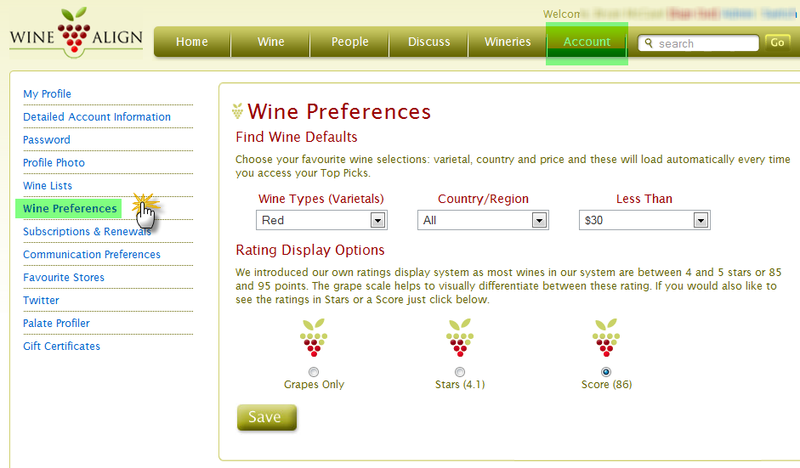 From the Wine Preferences screen, you can choose your favourite wine selections, countries/regions and price. These settings will load every time you access your Top Picks. 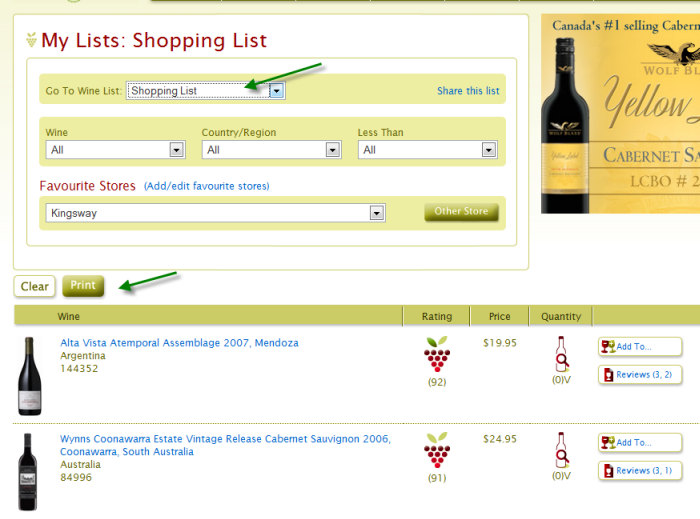 Click on each of the 3 drop down menus and select your preferred Wine, Country or Region and Price. Just send an email to [email protected] and we'll delete it ASAP. To edit your profile settings, click on the Account tab on the main menu. How can I Find or Search for a wine? 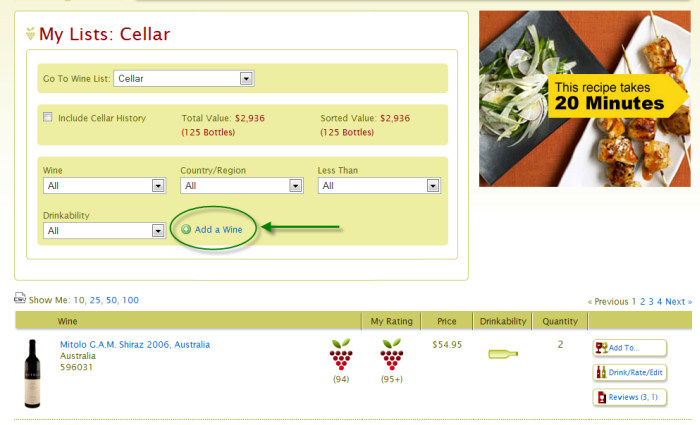 1) You can Find a particular wine type or varietal using the wine filters on the Find Wine page. You can narrow your search using Country/Region and Price. The wines that are displayed will be based on the selections available in your favourite stores. 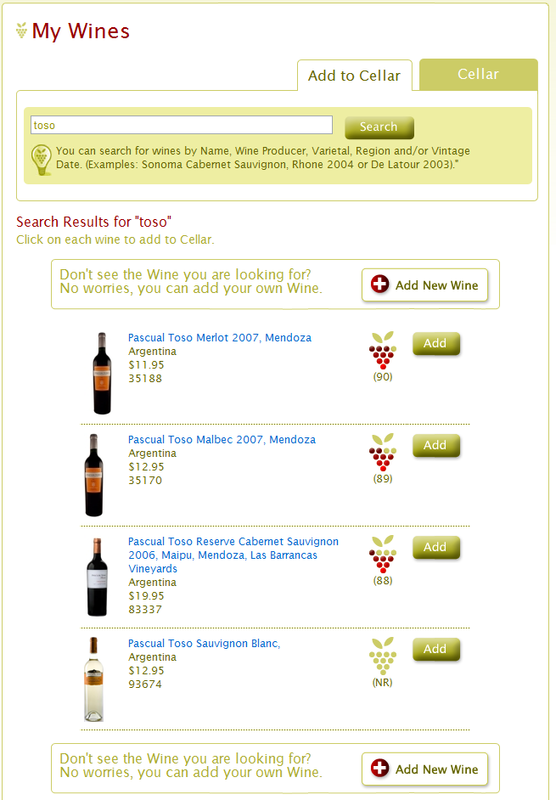 Note that the Find Wine page only displays wines that are in stock at the selected store. 2) Use the Search found in the top right corner of the screen. You can search on a variety of keywords including: LCBO number, name of the wine, wine producer, varietal, type, region and/or vintage date. NOTE: All wines in the system meeting your criteria will be returned using this search method and not based on availability of these wines at your favourite stores. 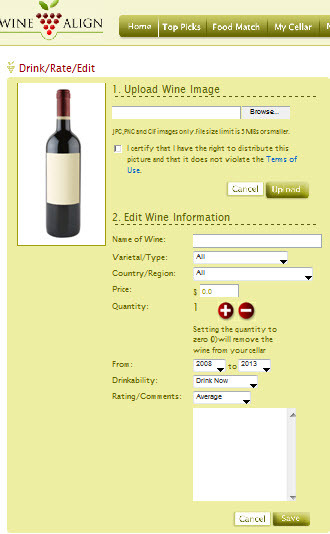 To find a wine using this method, click on the name of the wine (to show the details) and then click the “Find this Wine” button on the right. A list of stores will be displayed. 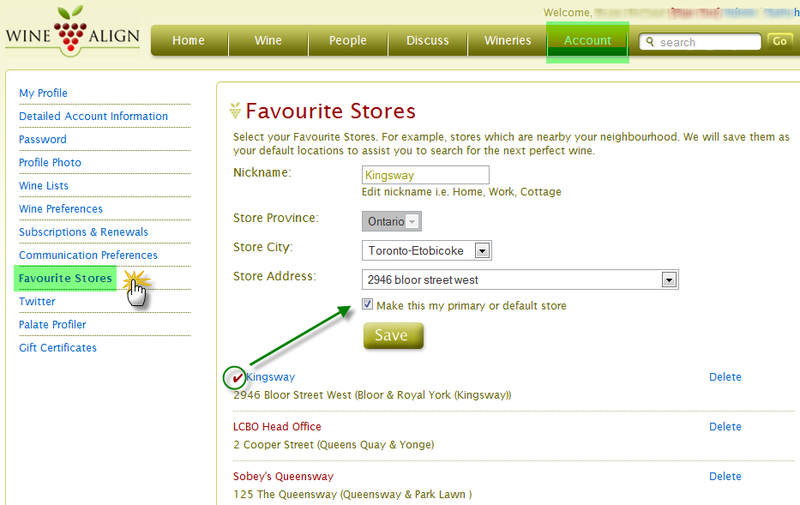 Stores are listed by proximity to your postal code. How do I notify you of a mistake? We strive to be as accurate as we can with our data. 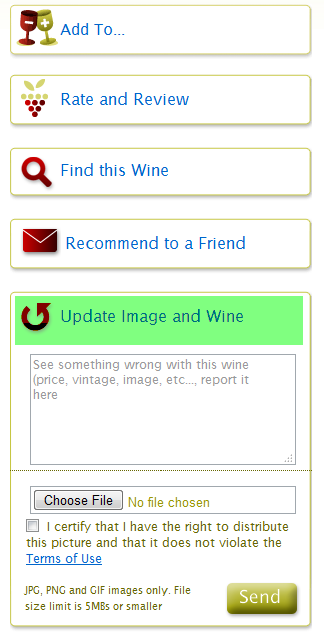 If you see anything wrong with the wine, like the name, image, vintage, region etc you can let us know by clicking on the Update Image and Wine button. Tell us what is wrong or upload a new image. How do I use the Find Wine feature? When you click on the Find Wine feature in the Wine tab, the wine results displayed will be based on the settings you have defined under Wine Preferences in My Profile. The top wines will be listed based on their rating and the price category you have selected. The quantities available at the stores you defined will also be listed. From here you can change, or further refine, your wine search by changing the type of Wine, the Country/Region, the Price or the Store. You can also used the Advanced Search feature found on the top right of the screen. To view details on any wine in the Find Wine list and read our Critic’s Reviews, click on the link of name of the wine. From the Wine Details page you can Add or Remove Bottles from your Cellar, Rate and Review the wine, Find this Wine in a store other than your Favourite Stores, Recommend to a Friend or Update the Image and Inventory of the wine. Why can't I find a wine? Not all wines are in our database... yet. We’ve been focused on Vintages (which is well covered) and then adding wines from the general list that have been well reviewed. Our next project is to round out the general list with all inventory. 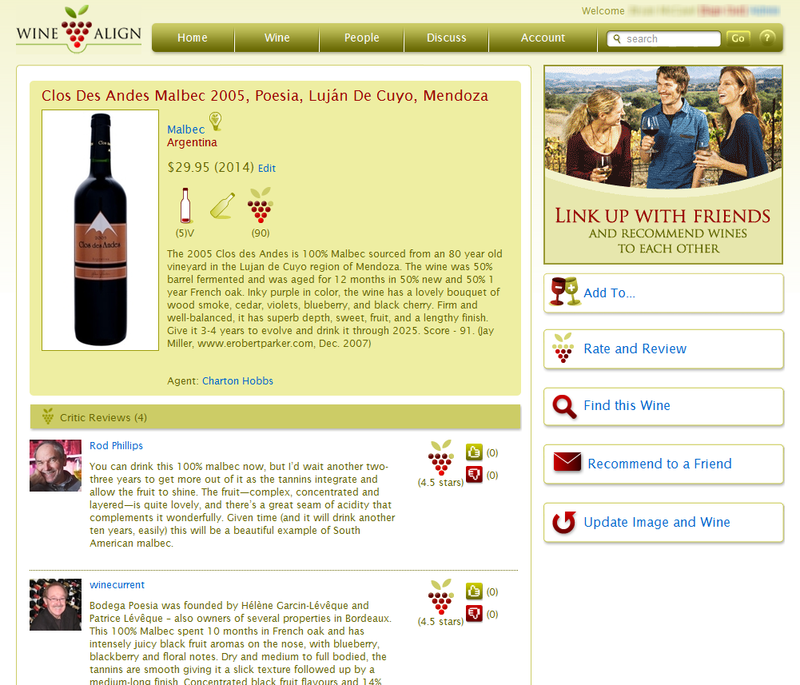 Inviting friends to join you on WineAlign will allow you to share wine recommendations and wine reviews with each other. 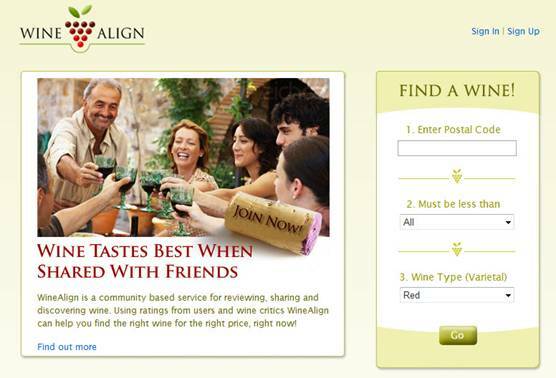 To invite a friend to join WineAlign, go to the Friends tab, type in their email address, along with your message and click send. 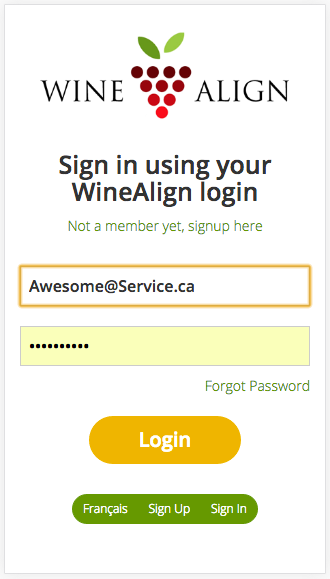 An email will be sent to your friend with a link to WineAlign, inviting them to sign up for the service. 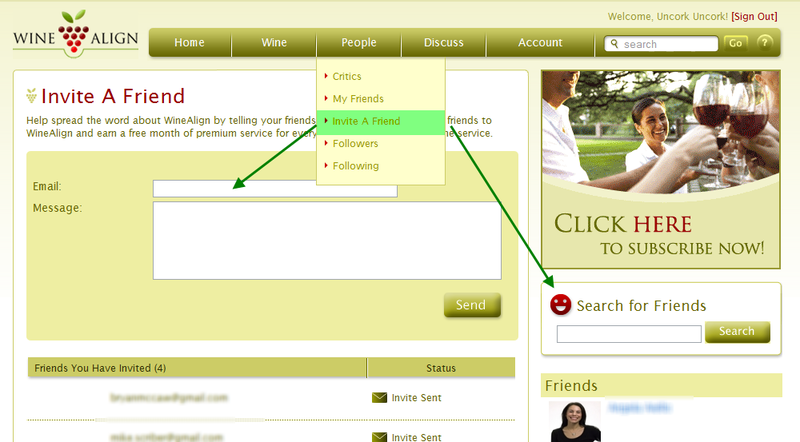 To check to see if you have friends already using WineAlign, you can search by using the Search for Friends box to the right. Once you find people you know and that you'd like to add to your friends list, click the Add button beside their name. A friend request will be sent to them. What's this Followers and Following stuff? 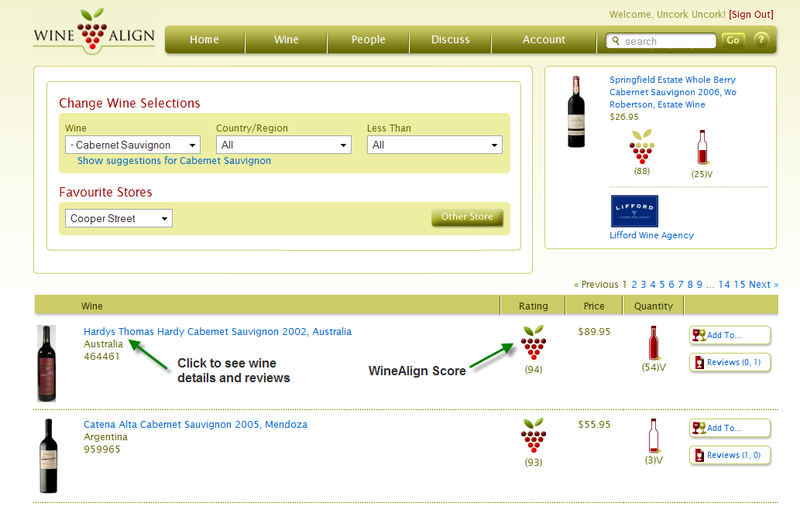 WineAlign allows wine scores you see to be influenced by others. People can choose to be Followers of your scores. When you rate a wine it will have a larger than average impact on the scores they see. These people are shown as Followers. You can choose to Following someone by changing the influence/weighting that others have on your wines. Whenever you change their influence level (None, Low, Medium, High) you vary impact that their scores have on your wine ranking lists. These are shown as people your are Following. Once friends you invite register with the service you will be able to easily share wines with your friends and share in their activities. In addition, for every friend you invite who registers with WineAlign you will receive one free month of our premium service. What do the thumbs up, thumbs down icons mean? Beside each wine review you will see a small thumbs up and a thumbs down icon. By clicking on either icon you can indicate whether you agree or disagree with a review. You can vote on reviews and over time we will use these statistics to better tune our service to meet your needs. What do those Drinkability icons mean? There are there drinkability icons. What do those inventory symbols mean? There are four inventory symbols. The amount of wine in the bottle represents the number of bottles at that particular LCBO store. Note that you can click on the bottle image at anytime to find the inventory levels of the stores based on proximity to your postal code. What is that Add To... icon? The Add To... icon is actually a widget. We use this widget everywhere on the site to allow you to quickly add wine to your an area we call My Wines . To use the widget just click on it and it will expand. Just click on any of the check boxes. What is the Reviews(x,y) button? 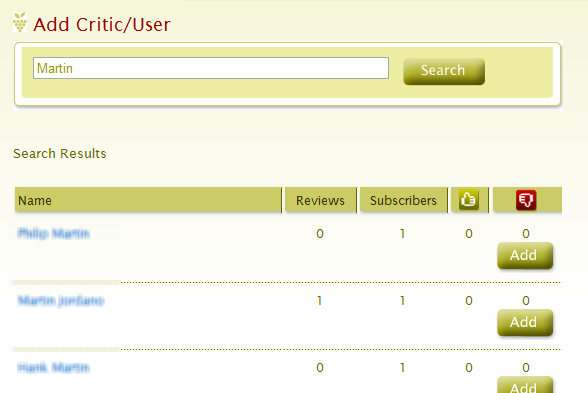 This button shows is a quick link to wine details and shows the number of critic's reviews X and user reviews Y. What is your WineAlign Score? The WineAlign score is our way of ranking wines. The grape scale helps you to easily visually differentiate between the ratings. The grapes populate from the bottom to the top with a full bunch being our highest rating of 95+ points or 5 stars. We introduced our own ratings display system as most wines are between 3 and 5 stars or 80 and 95 points. The grape scale helps to visually differentiate between the ratings. If you would also like to see the ratings in Stars (out of 5 stars) or a Score (out of 100) you can do so in your Wine Preferences . 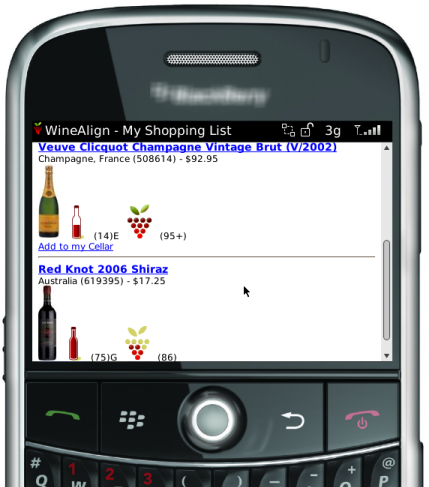 The WineAlign has a website that is optimized for mobile browsers. Simply point your mobile device to here: mobile.WineAlign.com and sign in with the same email and password you do on the web version. Yes. The Android app has all of the convenience of our mobile app including barcode scanning. You can download the WineAlign Shop & Scan app from the Google Play store here and the Chacun Son Vin app here. Do I need to Sign Up for the service? • A personal profile outlining your preferences so you don’t have to re-enter information each time you use the system. 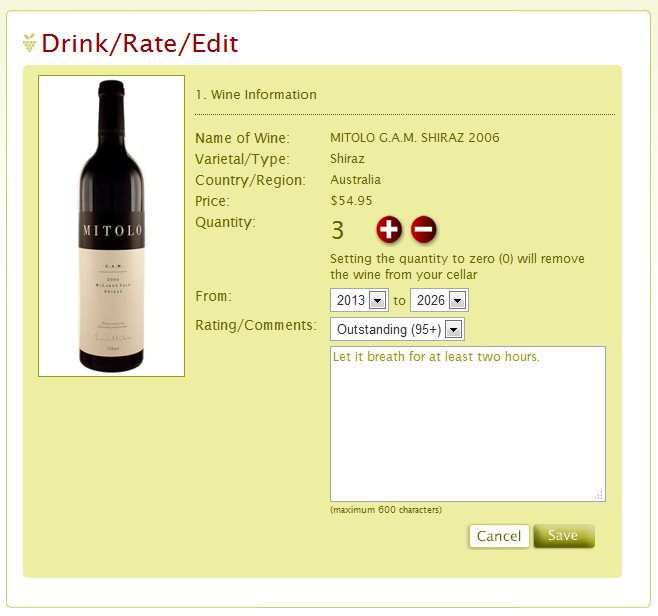 • Ability to see detailed notes and descriptions of the wines as well as input your own notes and ratings. • Access to a virtual wine cellar where you can store, organize and rate your wines as you purchase and consume them. • Access to reviews and ratings from other users. • Ability to connect with friends and recommend wines to each other. • Access to the mobile version of the service which you can use while shopping in your local government wine store. How do I find a wine if I’m not a member? To find a wine is simple! 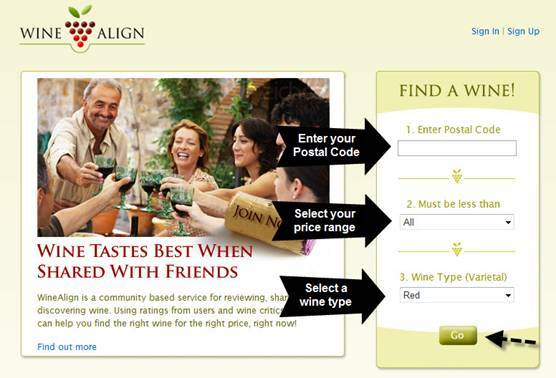 You don’t need to member of WineAlign to find a wine, but as a member you will enjoy many additional features and signing up is Free! 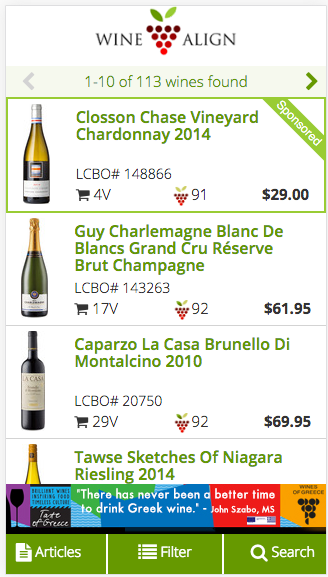 Simply enter your Postal Code, select your price range, select a wine..... and click Go. It’s that simple. Your wine results will be displayed and the quantities in the liquor stores in your neighbourhood will be listed. From here you can further refine your wine search by changing the Country or the Store you prefer to shop at. In a word: Nothing. We will not sell or distribute your detailed personal information to any 3rd party. We will not use your email address to send you any unsolicited offers. We may use your information, in an aggregated and non-personalized manner, for targeted messages while you are using our site. 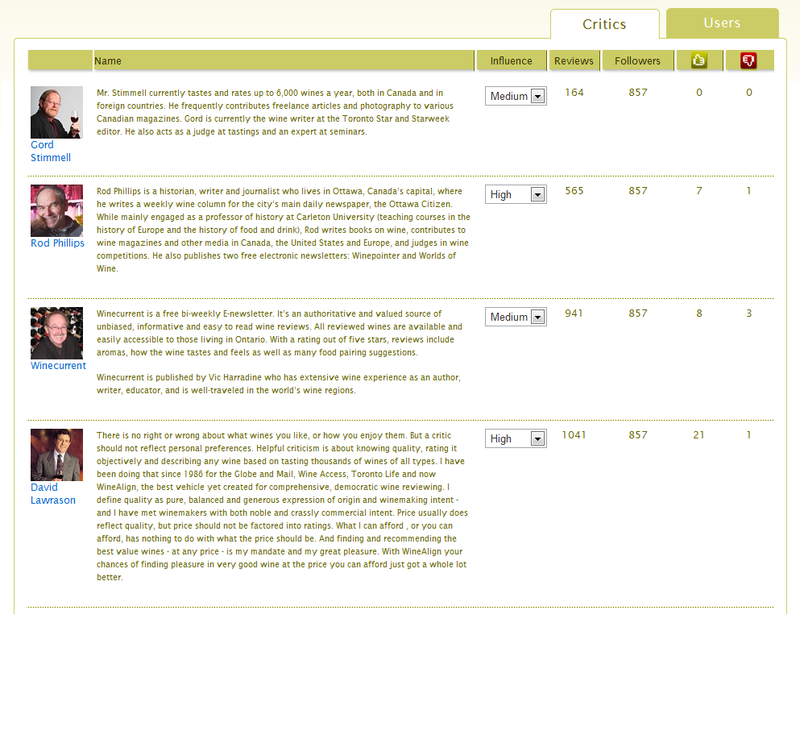 How do change my palate profiler, add critics or add users? To change your Palate Profiler settings, click on the Account menuand then click on the Palate Profiler tab. The Palate Profiler allows you to vary the amount of influence a certain critic, or friend, has on the consensus or aggregate score of a wine. By varying the weighting you can change the level of influence of critics, friends or other users. Click the “Add User” button in the top right to adjust your own level of influence or add others to your unique Palate Profile. 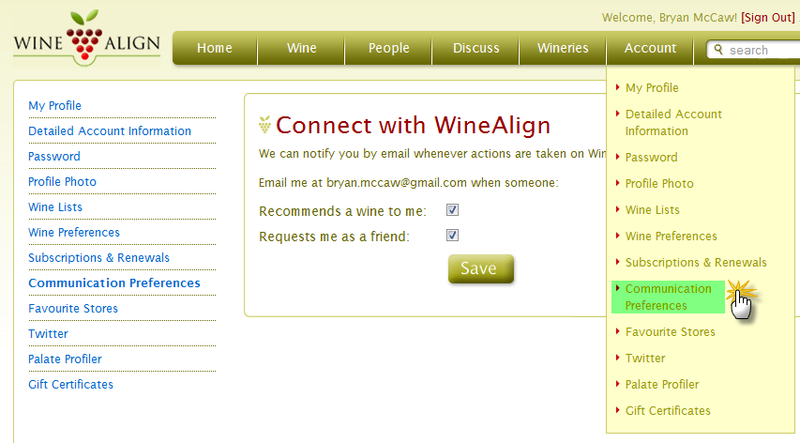 Upon clicking the Add User button you will be required to search for the WineAlign user. Enter the person’s name and click the Search button. When you see the name of the person you wish to add, click the Add button to the right of their name. 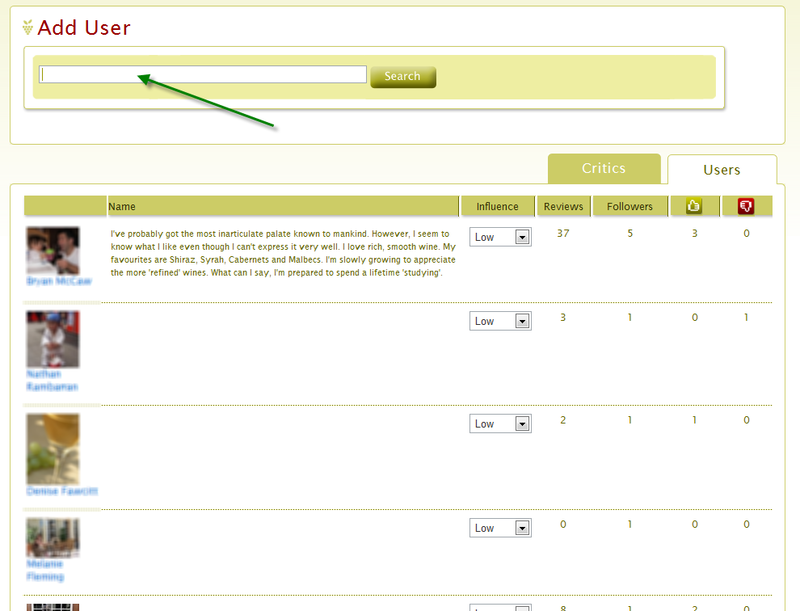 To change the weighting or influence of a critic or a user, click the Edit Weighting button. What is a Palate Profile? 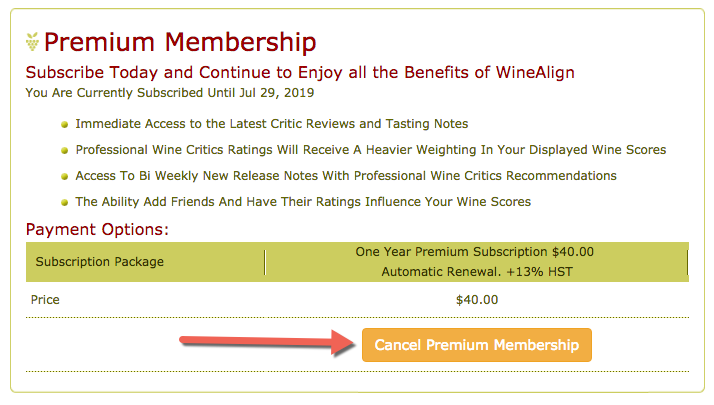 If you are a subscriber to WineAlign you have the ability to vary the influence that reviewers have on your wine rankings. With this feature you can tune your palate to those critics and members who tastes you align with. By doing this you also prevent a 'rogue' review from canceling out a review from a respected critic. As an example, if you really like David Lawrason's reviews set him to HIGH and all other critics to LOW. Your wine lists will closely correspond to David's reviews. The other critics will have influence as well. Why can't I change influence levels? 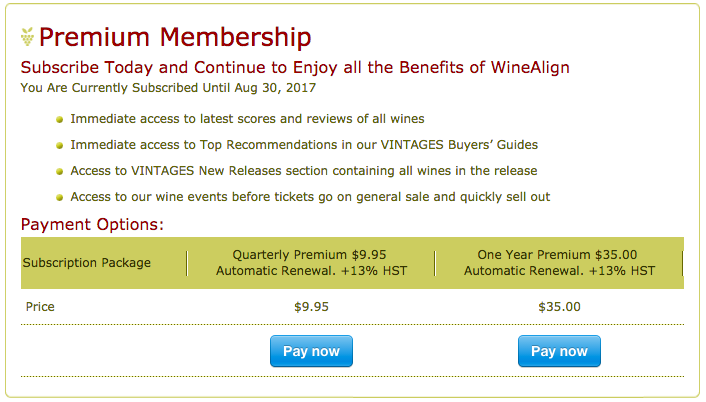 If you are unable to adjust your influence levels and they are disabled it means that you are not a subscriber to WineAlign. The ability to change influence levels is restricted to those members who pay. We think it only fair that if you do not value the reviews of our critics then their views will have the same influence as everyone else. How do I Cancel my Recurring Subscription Payment? If you subscribed before November 2015 via PayPal you need to login to PayPal -> Profile -> Preapproved payments and cancel. Detailed instructions are here. After cancelling future scheduled payments will NOT be processed. If you became a subscriber after November 2015 there is a convenient "Cancel Premium Membership" button on the Subscription page. Just click on the button and your subscription will be cancelled immediately and future scheduled payments will NOT be processed. We use Stripe as our secure, integrated, third-party payment processor. We do not store your credit card information. 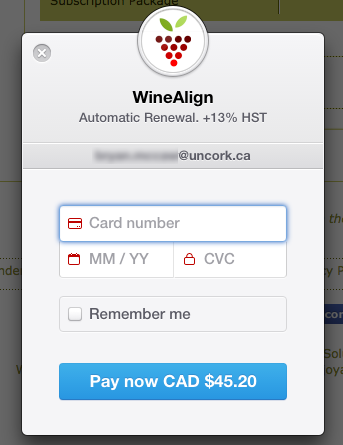 To subscribe to WineAlign simply go to our Premium Membership screen and click on the blue PAY NOW button and fill in your credit card information in the pop-up. How do I build and share a List? 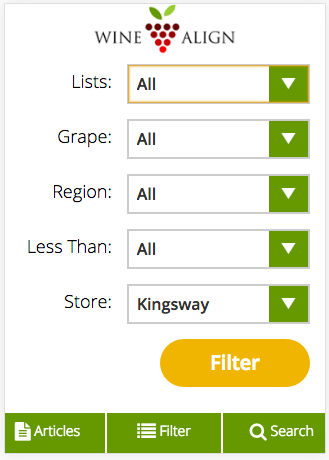 You can create lists of wines to share with others. If you have friends who never know what to buy for your 'discerning' tastes, make your Favourites list public and send them the link. If you want to build and share a list of your favourite Pinots at the LCBO you can do that too. There is a new Add To... button menu and a new link to My Lists which contains all of your lists: Cellar, Favourites, Shopping and all of your new custom and shareable lists. We've updated the list screen with a new drop-down to make it easier to navigate between your lists. If you wish, you can click on "Share this list" to make a list public. Simply copy the link (web address) from the screen and send it to friends. How do I use My Cellar? My Cellar is a virtual wine cellar enabling you to keep an inventory of all the wines you have in your cellar. In My Cellar you can update the number of bottles you have and add manager your own ratings and wine reviews. You can add wines that you find in the system, or add your own private, or custom, wines that you may have received as gifts, or purchased privately through a wine agent. To make a custom wine entry into My Cellar, click the Add tab and search for the wine. You can add wines from most menus using the Add To... widget. 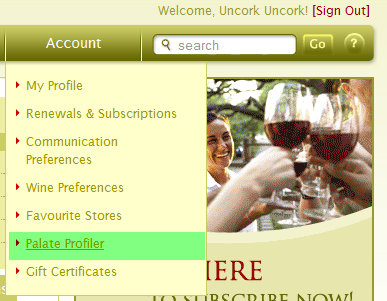 Or you can search for wines by Name, Wine Producer, Varietal, Region and/or Vintage Date. Examples: Sonoma Cabernet Sauvignon, or Rhone 2004, or De Latour 2003. 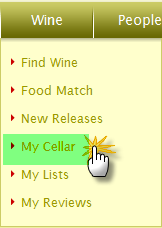 Once you’ve found the wine you’re searching for, click the Add to Cellar button. 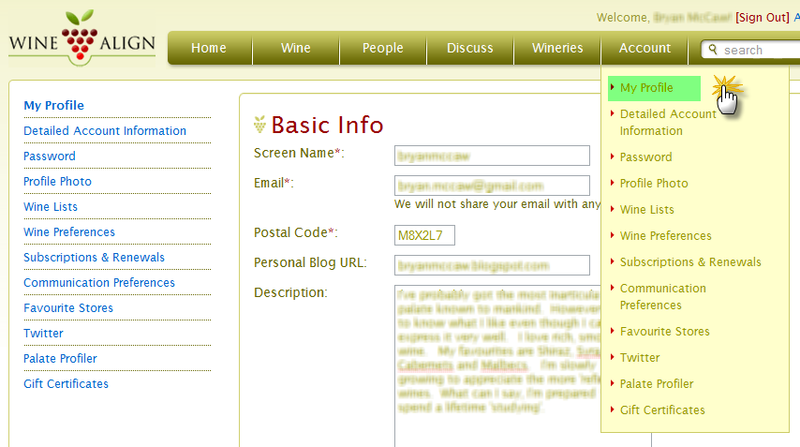 If you don’t find the wine you are looking for in WineAlign, you can make your own custom wine entries into My Cellar. 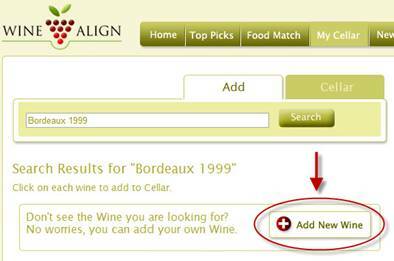 First, from the My Cellar, Add tab, search WineAlign to see if a wine exists in our system. If it is, Add it and customize your wine if you wish. If our system does not return any results, simply click the Add New Wine button to make a custom entry into your cellar. 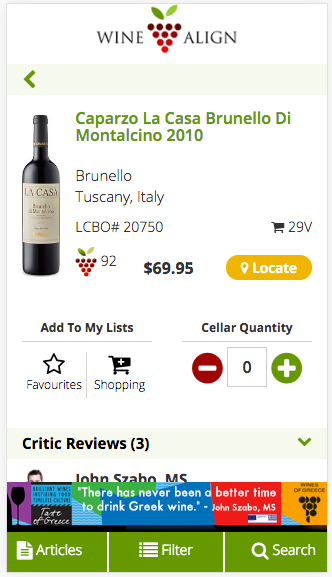 Once you’ve clicked on Add New Wine, you will be able to enter the details on the wine including the price, drink dates, a rating, your review and you can even upload an image of the bottle if you have one! Once your wine is in your cellar, you can enjoy your bottles and manage your inventory levels by clicking on the Drink/Rate/Edit button. 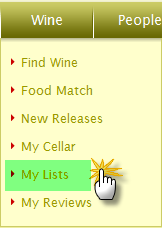 You use lists to manage your Cellar, your Favourites and your Shopping List. In addition, you can use My Lists to build and share custom Wine Lists. 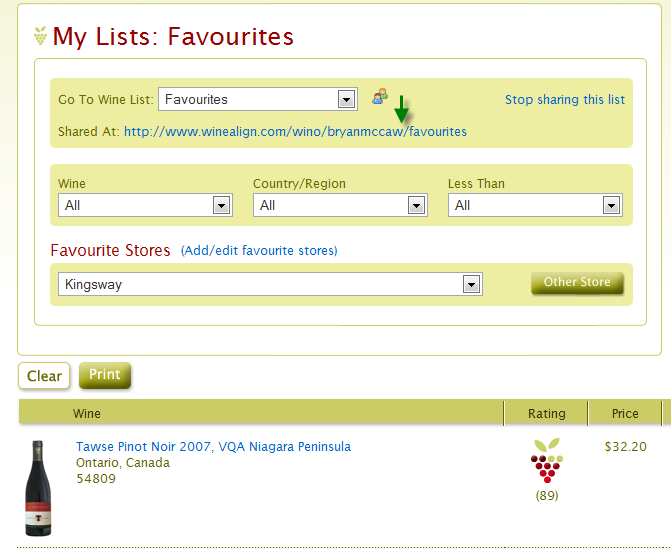 Favourites is a storage list for wines that you really like. Stick them here and you can access them quickly from your mobile. Best of all, you can share your list with friends so they always know what wine to bring over. YOU'RE WELCOME! When you see a wine you want to purchase just click on the "Add To..." widget. When you are at the LCBO you can use your mobile phone to access your shopping list while standing in the store. Optionally, you can go to My Lists -> Shopping List and print your list off before you go to the store. Note to remove an item from a list just click on the check box, it will clear the check mark and remove it from the list.